Nhat Le beach stretches by pure white sand, from off-shore, layers of waves as suds flowers reach nearly seashore and create overflowing sounds forever. Beach is clean as a new mattress, sand is shining in morning sunny, tourists can bike bicycle and play soccer comfortably. 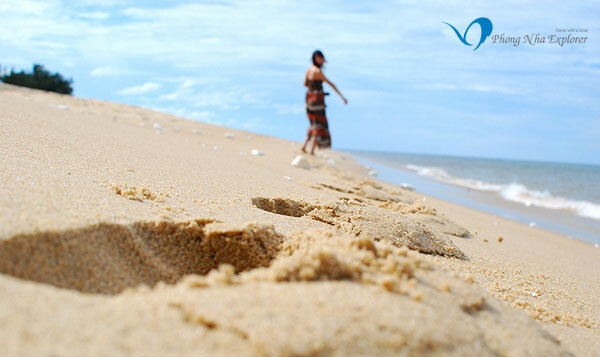 Nhat Le beach is favored wild style white sand and blue water sea. For a long time, Nhat Le beach is known for immense sky and sea, windy sky, blue water. If you wondering what to do or looking for fun, cheap things to do in Nhat Le beach, Dong Hoi, let me introduce you. In Nhat Le beach, you, tourists, may enjoy a series of interesting relaxation activities. On arrival, you should take a walk alongside the romantic mirror-like Nhat Le River, and let your soul leisurely “drift” with the rippling river waves, in order to feel a poetic sparkling Nhat Le. The name Nhat Le coming from a legend that the Trinh Kingdom and the Nguyen Kingdom conflicted so the river was divided into two sides. Southern Immigrants often look to the North bank to remember their homeland. Their tears flowed down into rivers then flowed into the sea so the beach was called Nhat Le. When the dark comes, they can contemplate sea beauty, sparkling water mixes with silvered moon, remotely, the light of fishing boats become bright as “ night city” floating on the water surface. Here, you should make use of time to view wild beauty of Nhat Le beach, steep yourself into rolling waves or take the sun. The early morning is perfect time to enjoy yourself on the long-lasting sand bank, which is compared to “Sahara Desert of Vietnam” to know how hot and sunny it is in Quang Binh, before dipping into the very cool, fresh and blue sea water. From dawn to dusk, immense sky and sea area is always eventful with laugh sound of tourists and local people in activities as soccer, volleyball, badminton, and so on. However, Nhat Le also has romantic moment when the sun sets. This is the sound of wave in late afternoon, is talks of lovers, and is hearts of husbands, fathers who are catching fishes offshore towards their families.